Tonto Dikeh’s ex-boyfriend, Michael Awujoola a.k.a Malivelihood and his girlfriend of two years, Deola Smart, are officially engaged. 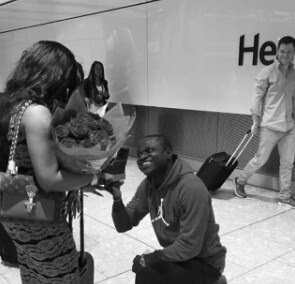 The jeweler shared a photo of the proposal on his IG page and wrote; “She said YES… Happy Birthday To My Fiancée @deolasmart #HeathrowAirportProposal”. He proposed to her on her birthday with a custom made ring, worth $156k. Deola is the daughter of former Kogi state senator, Mr. Smart Adeyemi.